Social media sites like Twitter have played host to many #Brexit or #BrexitShambles debates over the past year. 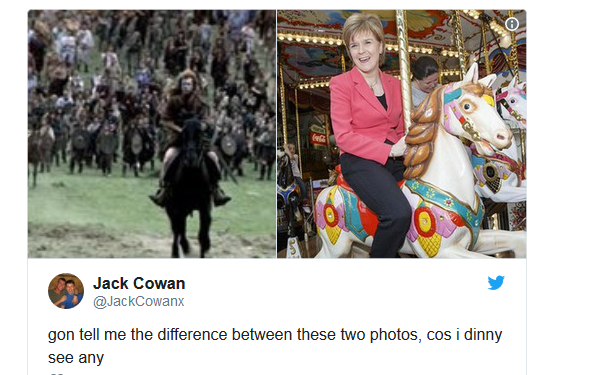 And as the time ticks on, the tweets and memes have become more than a little amusing. 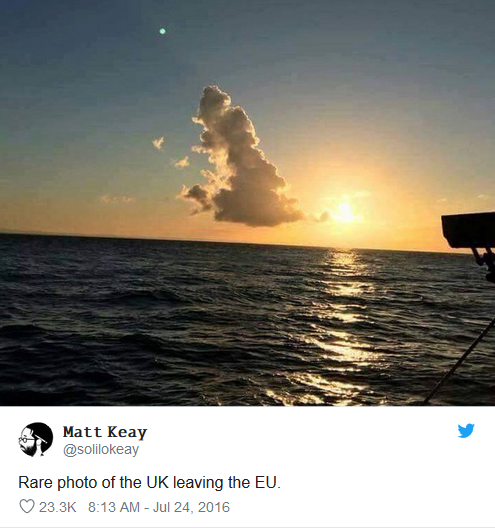 Here’s a rundown of the 20 best Brexit tweets compiled by our team. 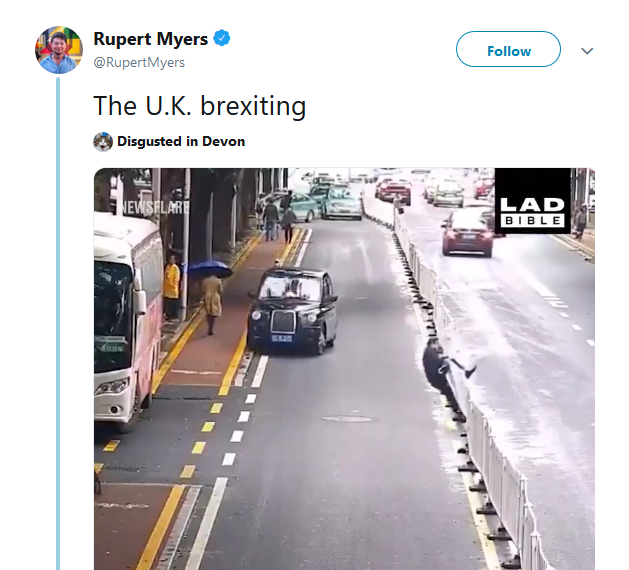 Rupert Myers’ interpretation of the ‘UK Brexiting’ perfectly portrays the drama that’s unfolded over recent months. His shared post showing a man trying to unsuccessfully cross the road causing havoc in the process was liked 176,000 times and received 62,000 re-tweets. Rice is a quick-fix solution for many common issues – such as dropping your phone in the toilet. So, maybe this tweet isn’t so far off the mark considering the UK appears to need some assistance. This pretty much hits the nail on the head. 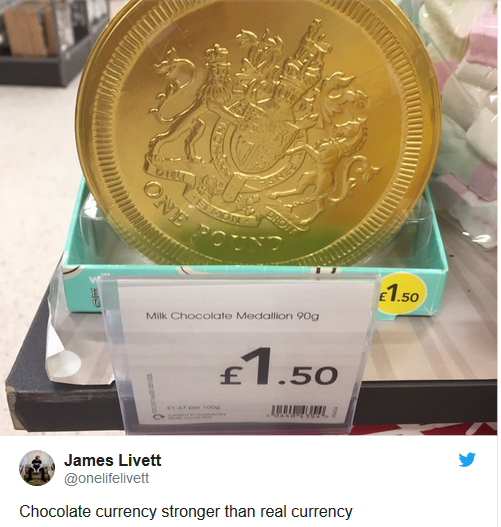 Brexit’s super ‘hot’, but not in a good way! Alice McMahon also had us chuckling with her Brexit credits idea and reference to the much-loved show the Great British Bake Off. Upsetting a British icon? Oh, the outrage. Oh, the trauma! 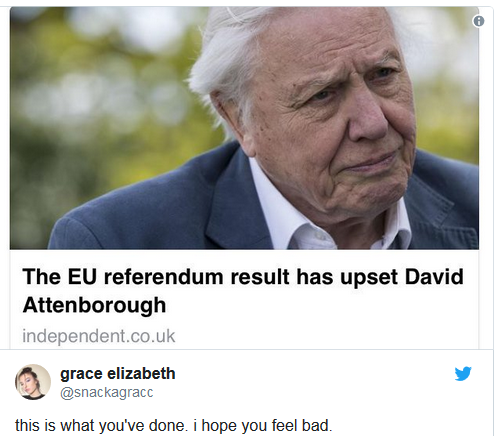 What has national treasure David Attenborough ever done to you UK politics? Keep calm and carry on. How apt! Stiff upper lip and all that. 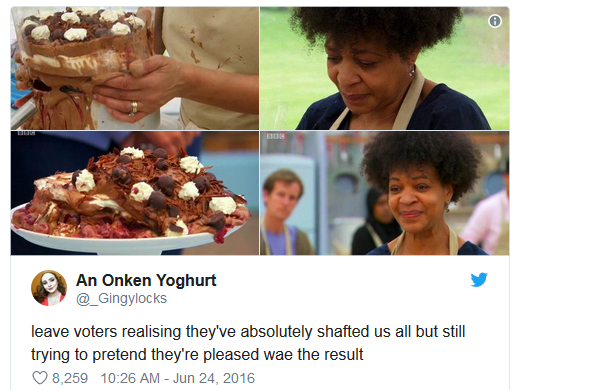 Indeed, it seems comparing Bake Off to Brexit is the thing to do in times of crisis. No words. Laughing into our tea as we try not to lose sight of the seriousness of Brexit. 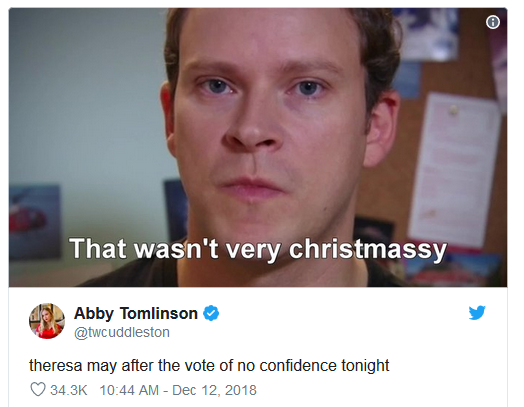 Abby Tomlinson predicted May’s reaction at the confidence vote last December, with a picture from TV series Peep Show captioned “That wasn’t very Christmassy”. Comedy gold. Oh Ed. Whipping out the humour, even in the darkest of moments for poor old May. 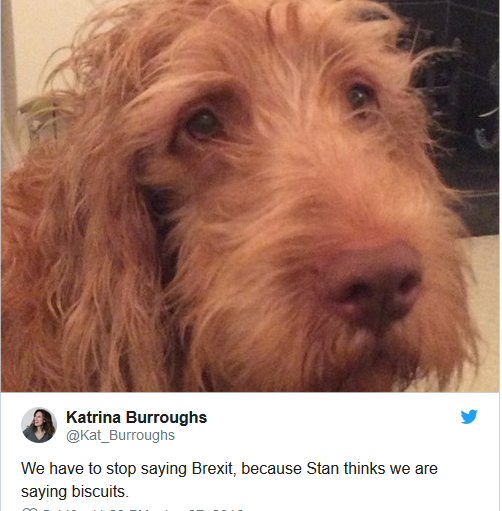 Katrina Borroughs keeping it real with a gorgeous pic her dog and a side-helping of Brexit humour. 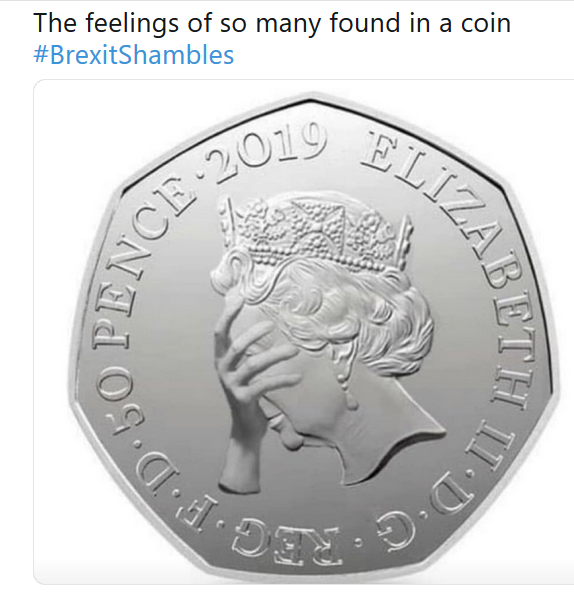 The image reflected on this coin leaves little to the imagination when it comes to Brexit sentiment. No matter how you voted, the entire saga has been undeniably painful to watch at times. As Antonio Ventre pointed out, it’s all about the finer details. 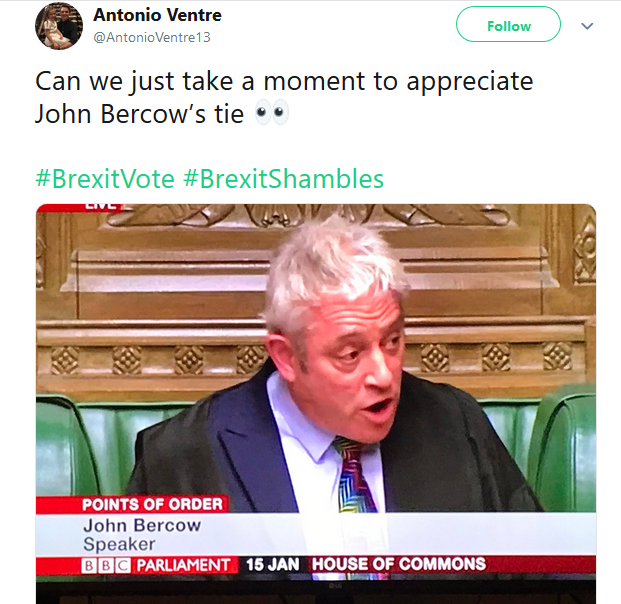 Nice tie Bercow. It’s always good to have some sort of plan. Right…? Be sure to keep an eye on currency prices and market movements. 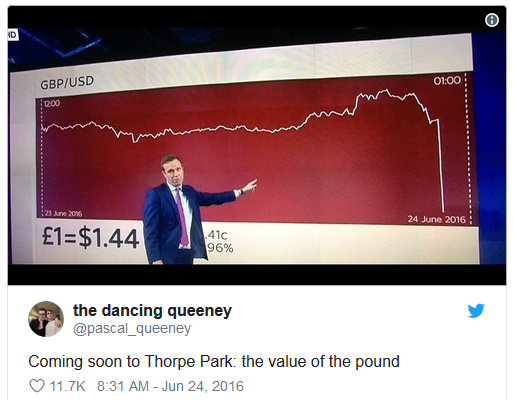 When Brexit news first dropped, the pound took quite a hit sparking an array of related tweets. Nothing like a movie reference to lighten the mood – or not! 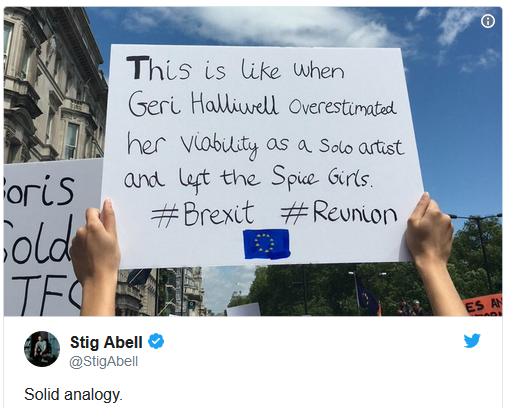 A solid analogy? What do you think? Here at Contentworks, we follow market moving events like Brexit and can provide up to the minute content marketing and social media for financial services clients. Contact us today for financial services marketing to suit your business. « Can a Content Marketing Agency Save Me Money?